Carbon dioxide released into the atmosphere after the impact of the Chicxulub asteroid, which ended the era of dinosaurs some 65 million years ago, warmed the Earth's climate for 100,000 years, a new study has revealed. The study, based on an analysis of fossil records, suggested that the Earth's overall temperature increased by 5 degrees Celsius (9 degrees Fahrenheit) over that time. 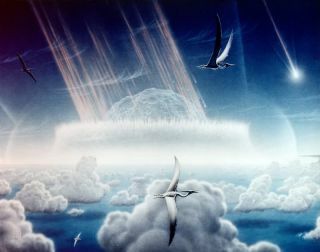 Scientists have long theorized that after the piece of space rock with a diameter of 6 to 9 miles (7 to 14 kilometers) smashed into the Yucatan Peninsula near today's town of Chicxulub in Mexico, the temperature of the planet first rose sharply for minutes or hours, MacLeod said. After that, it plunged down for months to decades, because the huge amount of dust and soot thrown into the atmosphere by the impact blocked the sun's rays. Eventually, however, carbon dioxide released during the impact led to global warming. MacLeod's study is the first to present empirical evidence of how long this greenhouse gas-related global warming lasted and how substantial it was. "This place is known for having a beautiful record across the interval that we are looking at — the so called Cretaceous-Paleogene boundary — the mass extinction event following the Chicxulub impact." The researchers looked at the concentrations of different oxygen isotopes in the fossils. These isotopes differ in the number of neutrons in the oxygen atom and, according to MacLeod, behave slightly differently from one another. "One of the differences is, as temperature increases, the amount of the light oxygen isotope, oxygen 16, in a mineral increases relatively," MacLeod said. "We are measuring the ratio of oxygen 16 to oxygen 18. Every 1 part per 1,000 that the ratio changes correlates to an about 4.5- to 5-degree [C, or 8.1 to 9 degrees F] change in temperature." The researchers analyzed 40 samples taken from the site in Tunisia: 10 samples from the 50,000-year period before the impact, 20 samples from the 100,000 years immediately after the impact and additional 10 samples from the following 200,0000 years. "We found that there was a really big difference in oxygen isotopes between these three sets of samples — unambiguous," said MacLeod. He said he and his team now want to look at fossil samples from other parts of the world and check for similar patterns. "It's one thing to find 5 degrees [C, 9 degrees F] of warming in North Africa. It's even more impressive to find 5 degrees of warming in North Africa and perhaps 10 degrees [C, 18 degrees F] of warming off the coast of Australia," he said. "That would really strengthen the idea that it's a global signal and a greenhouse gas-related change." The study, MacLeod said, not only sheds more light on what happened to the Earth's systems after the devastating collision, but it also raises questions about the consequences of current human activities. "If I were to draw a line under the lessons of this study for the modern era, it would be to contemplate the idea that what we are doing in our lifetimes will affect the Earth for the next 100,000 years, which is pretty daunting," MacLeod said.